Three weeks ago, club members hiked the Blue Diamond Canyon #1 Loop. 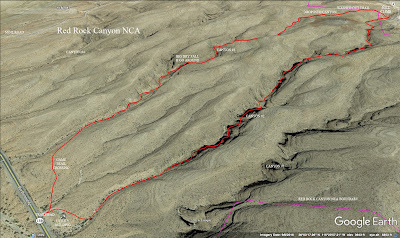 Today, we hiked the next two canyons to the west appropriately named Canyons #2 and #3. This scramble hike found across SR 159 from Blue Diamond has been in the club's repertoire for many years; first taught to me by Guy Galante and Howard Gray. Back in the old days, we used to bring along a strap for a climbing aide. Nowadays, we just scramble up without it on the four major dry falls hidden in the two canyons. Today, sixteen club members arrived at the gate in front of the utility building that is seen across from Blue Diamond on a little hill. As usual, we were careful to park on the sides of the driveway so we wouldn't block anyone. And, in fact, as we were gathering, a cable guy van unlocked and entered the gate. We happily walked right through to start our hike. If the gate had been closed, the fence can be easily passed through. The fence is there to control the burros. We hiked up the hill behind the building then dropped into Canyon #2. We chose to drop in where the canyon "wall" is very easily sloped. The second option is a little further up; a trail that leads down a sharper slope. Either entrance then requires a bit of hiking in the boulders and around honeysuckle mesquites (Catclaws). 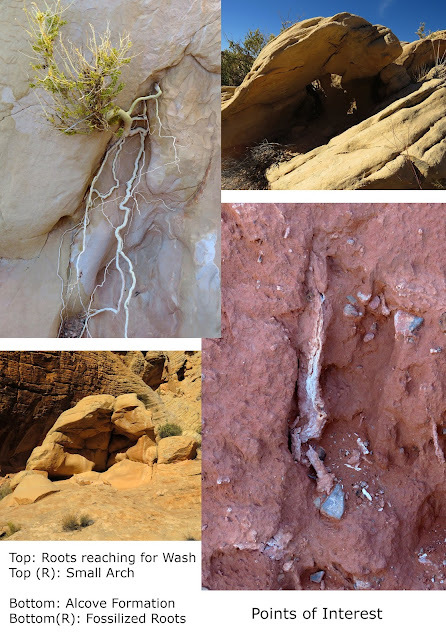 Note: The brush in both canyons has grown. Oftentimes, we had to dodge everything from catclaws to chollas that were reaching out to touch someone right in the middle of the pathways. After the initial struggle through the lower wash, we came to the first dry fall, a slippery sloped but climbable solid rock slide. The bee's nest that used to be here has been gone now for a couple of years. The character of the canyon comes alive at the top of this fall. Solid rock floors and barrel cacti in the walls join in on an adventure up several stair-stepping rises. The next dry fall is the first of the four major ones. It has a rope that has been bolted into the top of the climb for years and years. Today, it seemed to be well-maintained. A foothold shelf in the abyss under the bolted rope about half way up the climb helped each of us to gain the top. Mike and Tony were very helpful at the top and the bottom to make sure the smaller hikers were able to make the scramble's reach. Following this, there were a few stair-stepping climbs we scrambled right up. The pace accommodated the group with a stop now and then for a drink of water. In spite of the cold morning that dipped into the low 30's, we needed water breaks for our effort. The lull of the constant sloped climbing and the concentration on the best path to take, was interrupted many times by the beautiful scenery of the high-walled canyon and the view of Mt. Potosi in the canyon "V" when we looked back. Finally, the canyon widened temporarily. This was an indication that the second major dry fall was upon us. There is a go around trail here if you go straight. However, if you go along the wash to the right, you come to a mere 5 foot dry fall that requires some skill to ascend. Totally doable! With Mike and Tony spotting again, each hiker made the climb and I don't think anyone took the go around trail. Good job! Tony later spotted a nice grouping of seabed fossils to the west of this dry fall. There are individual Precambrian fossils that you can see in the rock of the floor and boulders all the way up the canyon. Coral, sponges, shells ... amazing! The next major dry fall wasn't too far away. 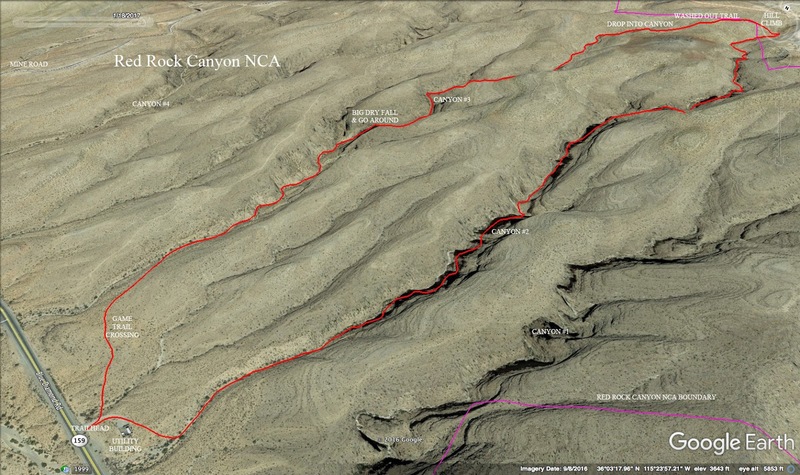 This last one in Canyon #2 is a narrow opening and must be climb either on the right or left side. The left side is fairly straight forward but, if you know the choreography, the right side is easier. Right foot on a smooth ledge on the wall below; right hand on a handhold on the corner above; then, left foot on a sharp ledge that sticks out from the dry fall. Then, up you go! The canyon begins widening slowly then the gypsum mine tailings appear (an unusual natural phenomenon that I cannot explain) high up on the hill to the right. (Accentuated by a very large tire on the ground next to the wash. Another unexplainable occurrence.) We never did see the resident owl. At the large tire, turn left and climb the hill until you reach a cross trail. Today, the trail was washed out and not easily discernible. A left turn on the trail brought us around the hill until we turned down into the top of Canyon #3. A peninsula at the top of this wash is a great place for a snack, in the sun and out of the wind. Next, we headed down into the canyon before us. This canyon is a little different in that the high walls don't start until about half way down. There are still several stair-stepping drops that keep things interesting. After a particularly interesting drop that several hikers participated in while the others went around, we came to the tour de force! The fourth and last major dry fall. An 8-9 foot drop! Of course, Guy and Howard would always pull out a strap for this and we would all have fun watching each other get down the drop! Without a strap, one way to do the drop can be done riskily on the left side. But, the best way is to go partially down on the right side after someone else (!) has gotten all the way down and use their help to make the rest of the jump drop. This is how four or five hikers got down while the remaining hikers did the up and around on the right wall. Fun! There are a few more stair-stepping drops after this. Each one different from the last. Watch for the rock nettle (velcro)! 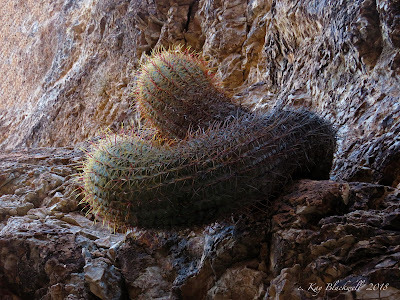 They are everywhere in these two canyons! Also, in the spring, watch for rattlesnakes! We saw a baby rattler one time in this area. We descended all the dry falls with their peculiarities and it seems I caught a rock nettle somewhere! Then, the wash flattened out with some boulder hopping. There is a trail that occasionally appears on the left side. Sometimes the trail helps. Other times it just takes you into more brush. Best advice is to stay in or near the wash as long as possible until you come to a barely discernible three foot climb out of the wash on the left side. (See photo at bottom.) This is a game trail that is also used by hikers to follow the wash down a little further then it starts crossing over to the left where you find the trailhead. The last large wash that you have to cross to get back up to the gate has a trail located at a short full tree. The trail across the wash brings you back up to the gate; then help each other get through the fence just beyond the gate. Always a winner! Not too hard. Not too easy. And, always fun! Great group today! 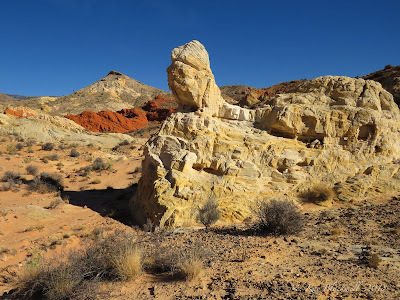 Gold Butte National Monument is truly a unique area. 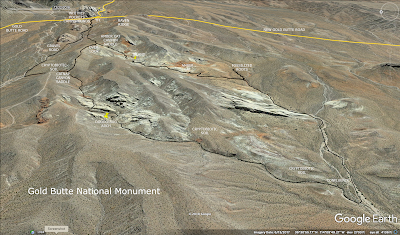 It was made a National Monument in December 2016 by President Barack Obama. Then, it survived the whittling of new National Monuments by the following administration with the help of strong support from the People. At this time, research is being done so that construction of an actual park can happen in the next few years. It is all very exciting! 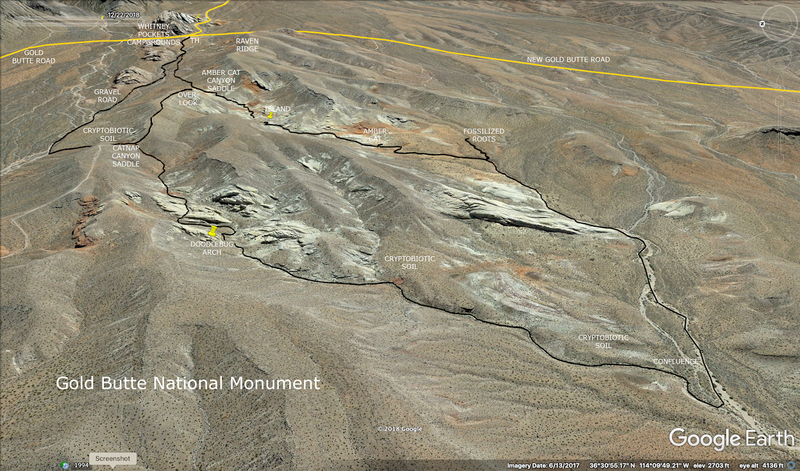 Perhaps some of our devised trails can become a part of National Monument history. Until then, it is very important for all of us to keep the area undamaged. Stay off the cryptobiotic soil! Keep 4-wheelers off trails and abandoned roads. Pack out all trash and don't leave fire rings assembled. Don't touch the petroglyphs. And, please don't graffiti over anything. These are things that should be second nature to all outdoorsmen and women. Bless you! 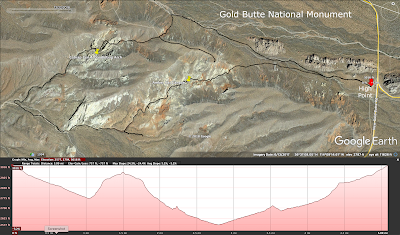 So, after a reminder talk about all that, ten hikers started out from the large parking lot on the right after the end of the "sort of pavement" of Gold Butte Road. This area is known as Whitney Pockets. And, there are a few large campsites dispersed around that usually fill up every weekend. 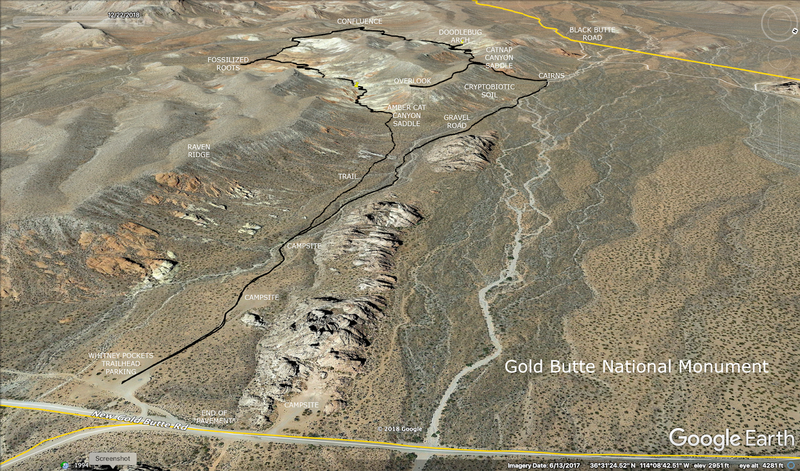 ATVs and Jeeps are a big thing in Gold Butte but they are relegated to the Designated Road Routes. 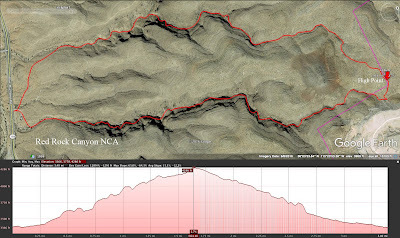 The Amber Cat Canyon / Doodlebug Arch Loop hike is new to the club and this was our maiden voyage. 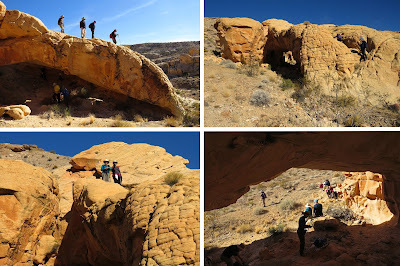 The hike is also known as the Doodlebug Arch Loop. 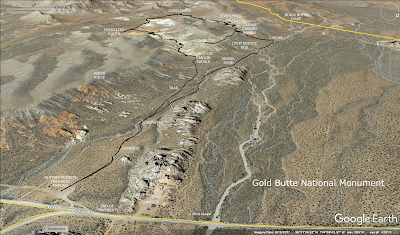 And, in fact, the hike begins by following the gravel road that passes two campsites down to the Catnap Canyon Saddle; the canyon in which Doodlebug Arch resides. It isn't too bad following the uneven washed out gravel road for a mile downhill. It is important that we waited until we saw the two cairns at a small wash that came into the road before turning up the hill to the second saddle. Burros and cattle have cut trails across the cryptobiotic soil to shortcut up the hill but I don't think they are as smart as we are. We turned left at the cairns and climbed the small wash trying not to drift one way or another. On the way up, we passed a nice large redstone outcropping. On the saddle, we saw Catnap Canyon in front of us but we turned to the left on an old abandoned road and followed it up the hill. The road cliffed out at an overlook of Amber Cat Canyon. We could see all the way down the colorful canyon and into the distance to Black Butte and Bitter Ridge. I pointed out the Falling Man petroglyph area. We saw that it was very important that we not get close to the edge of the cliff since it was unclear what, if anything, was beneath the soil we were standing on! A few hikers needed to make a wardrobe adjustment here since the sun was warming us up. We returned to the saddle and dove down into Catnap Canyon; so named because Tom Cluff was caught taking a nap in the canyon one time! 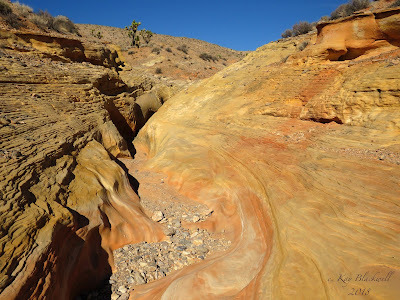 Determined to stay in the wash, we followed a worn wash trail down to the sandstone area. Even when there was a lot of sandstone around, we tried to use only the wash.
We came to a large sandstone slab and crossed over it. Then dropped into the wash for a narrow passage. The wash zigzagged then a use trail appeared to the right. Knowing we were in the arch area, I led the group up the hill and rounded the corner. Wow! Now, that's an arch! Doodlebug Arch is a big one! 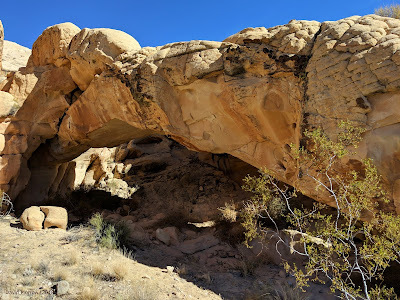 So named either for the abundance of ant lion craters under the arch or the shape of the arch resembling a larva of an ant lion called a doodlebug. Maybe both. Anyway, we stopped here for our break as we enjoyed the view and a little climbing. The arch is extremely sturdy! From here, we continued down the wash until we came to a particular dry fall that only three hikers conquered. The rest of us followed an up and around trail and dropped back into the wash. The wash becomes a little brushy but we stayed the course all the way down to the confluence of the Amber Cat Canyon wash and Catnap Canyon wash. Here, there is a wide area of gravel paths. We turned to the left and chose one of the widest paths. 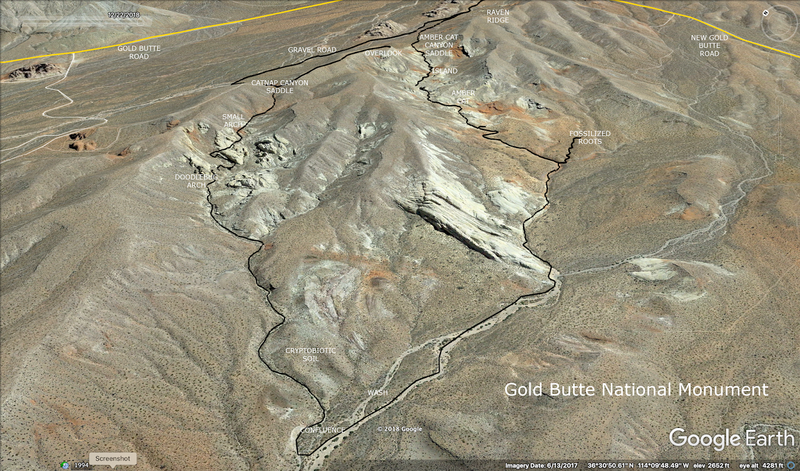 After about 1/3 of a mile, we started seeing yellow sandstone rising from the terrain. The wash began to narrow and we even had to step up onto the rock at one point just to get through. At the same time, we began seeing cat and rabbit prints in the sand. The wash became more and more colorful and interesting. Soon, we arrived at the junction of a red wash to the right. A quarter of a mile side trip up and back this smaller wash afforded us a view of fossilized roots in a solid red wall of dirt and sandstone. Back at the main wash, we continued up. This is where the canyon gets really beautiful with slots and curves and colors. For a short while, we just enjoyed the display of nature-made art and sculpture. When the canyon widened a little, we came to the Amber Cat formation. Set in a side wash, the huge formation sat on its haunches as seen in the first photo. Returning to the main wash again, we began a series of zigzags in the wash. There are trails offered to shortcut the curves but we stayed in the wash ... as promised. The Island of the canyon came into view dressed flamboyantly in red and amber. We continued our winding path as we made our way by. I noted the bird's nest up in the front corner of the monstrosity. 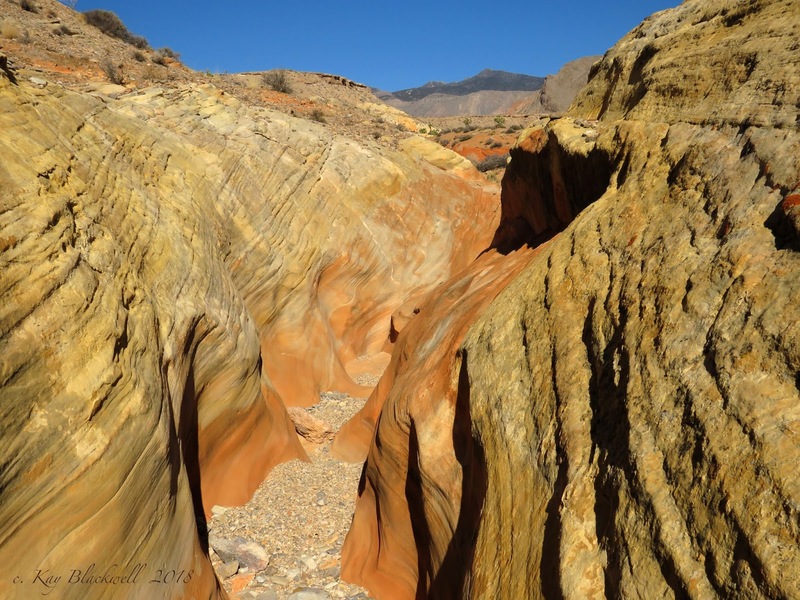 As we neared the top of the canyon, or the saddle, the wash gave us a few different suggestions. 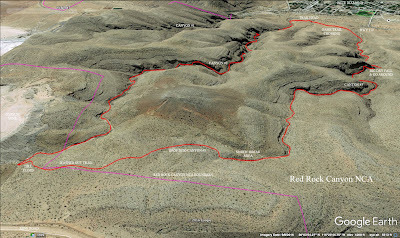 I picked the routes that made the most logical sense and we found the saddle trail up. Gathering one last time on the saddle, we turned to follow the offered trail toward the parking lot. The trail junctioned with the gravel road before we reached the cars. It was a wonderful day 3 days before Christmas. And, this hike is an excellent moderate hike to add to our repertoire. High clearance vehicles are not needed to get to the trailhead. 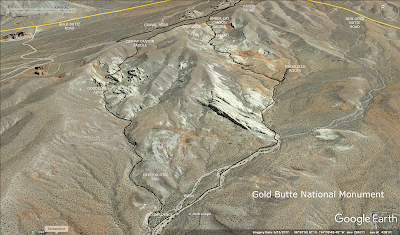 Unusual for Gold Butte. Thanks to David Morrow for adding a few photos to the blog. And, thanks to JB for suggestions and recommendations. 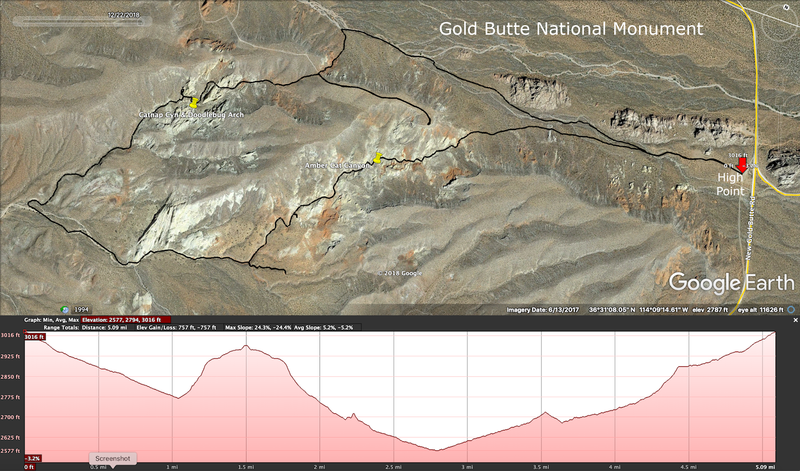 Yes, Gold Butte is a special place.